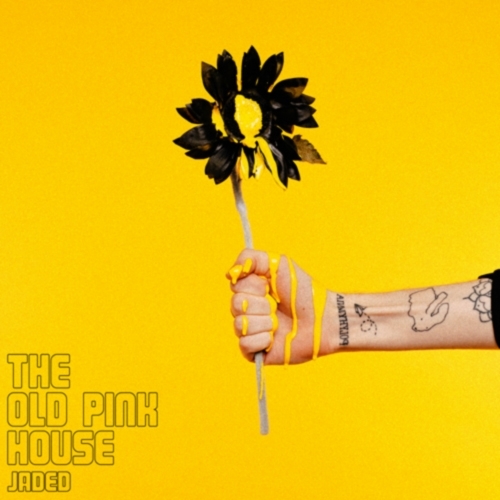 in the North East right now; I have been chatting with The Old Pink House about their start and where they are heading in terms of gigs; what the inspiration behind Jaded, their latest single, is; what we will get from their upcoming E.P. – I learn what the scene is like in the North East (and where they are based in Newcastle) right now in terms of promising acts coming through. I ask which new acts we need to look out for; what the band’s favourite memory is; what they hope to achieve in 2018; how it feels being supported by BBC Radio 1’s Huw Stephens; why they look to aspects of 1980s’ music for inspiration – the guys each select a tune to end the interview with. We’re a four-piece Cosmic-Pop band from Newcastle, U.K.
Tell me a bit about Jaded. What is the story behind the song? The song was born out of the guitar riff, originally. I think I just started playing it in our rehearsal room and Max added in that stomping beat - which just kick-started the process and the rest came quite easily. Lyrically; the song is about dealing with your emotions becoming blunted and weary over time and the need to try to combat that. It is the current cut from your upcoming E.P. Can you reveal the themes that inspired the E.P.? Musically, we’re quite a sunny, upbeat-sounding band but I always go to darker places for the lyrics and I’m fascinated with the way we deal with negative feelings, which stems mostly from my own problems with self-worth and guilt. How did The Old Pink House get together? When did you first start jamming? The band was born out of the break-up of a previous band. Max and I had been in a fledgling act which never really got off the ground and I, in particular, took it pretty hard. I just hid myself away and started working on demos which would become the first Pink House tunes. After about six months of trying to work up the courage to get out there and let people hear it, I found the other guys and we started playing shows. You are based out of Newcastle. What is the vibe like there? Do you think a lot of people overlook the city? It comes and goes. We’re in a period now where people are looking at Newcastle again, which is great, because there’s always been talent up here that deserves recognition. There are, of course, some great artists who have come out of the North East like Maxïmo Park and Nadine Shah more recently but, as we’re so distant from the main music centres like Manchester and London, it does feel sometimes like we get forgotten about. The band has been supported by, among others, BBC Radio 1’s Huw Stephens. Is it pretty strange having someone like that back you? How does it feel to get that backing? It’s strange when anyone takes notice, really, especially since most of our music comes out of me humming a melody in the shower or staying up all night programming drum beats in my spare room. It’s a wonderful feeling knowing that something you’ve made has impacted someone in any way, really. Which artists do you count as influences? Is music of the 1980s pretty important to you guys? We all have pretty diverse tastes which range from the likes of Black Sabbath to Kendrick Lamar. The main artists which inspired the initial spate of songs were probably Unknown Mortal Orchestra and Tame Impala and my own personal favourite band are Grizzly Bear. I think the 1980s sound sort of crept in and we fully embrace it - but I wouldn’t say that many '80s artists actually directly influence the writing of the music. At the moment, we’re focused on our own hometown headline show at The Cluny in Newcastle on 18th August, which we’re really excited for. We’ll also be showing up at Liverpool Calling and Evolution Emerging festivals in June and we’re planning some U.K. dates to be announced later in the year. Keep your eyes peeled! We just want to write and release music that we’re proud of and, if that helps us reach a wider audience and make new fans, it’s just a nice side-effect. I think, collectively, opening for The Cribs and the Manic Street Preachers was an experience we won’t forget. It’s the biggest stage we’ve played to date and the vibe was just so fun, it was an incredible feeling. For me, it would be Grizzly Bear because I love them. For the rider, I’d demand that the actor who plays Varys in Game of Thrones comes in full costume and feeds us hand-peeled grapes on a golden, ornate divan. Ignore what other people are doing and concentrate on writing good music that you care about. Don’t let social media engagement or any of that other extraneous crap worry you: as long as the quality is there in the music, and you’re willing to put the time and hard work in, the rest will come. Some quality North East bands that deserve a shout out are Penguin, Callum Pitt and FEVA. Imogen is pretty amazing as well! I try not to let music consume my life, and it can be difficult to disconnect from, but it’s important for my sanity. I’m an avid movie fan and I’ve recently been spending way too much time playing the new God of War game. It will consume your life.